When I’m not baking, blogging, making milk or toddler wrangling, my day job is in marketing. One sentence that always makes a marketer sigh is ‘how can we make this go viral?’ If it were an exact science, everyone would be doing it and often the most unlikely content swoops across the internet for reasons hard to fathom. 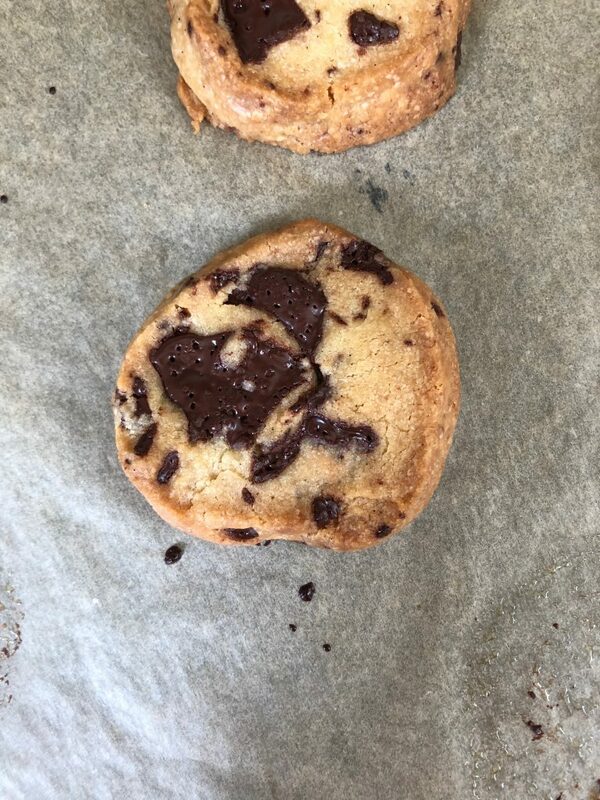 At other times, it’s a little more obvious, as in the case of these salted butter chocolate chunk shortbread cookies aka ‘the cookies that broke the internet’. I’m late to the party in baking these cookies, if Instagram is anything to go by. 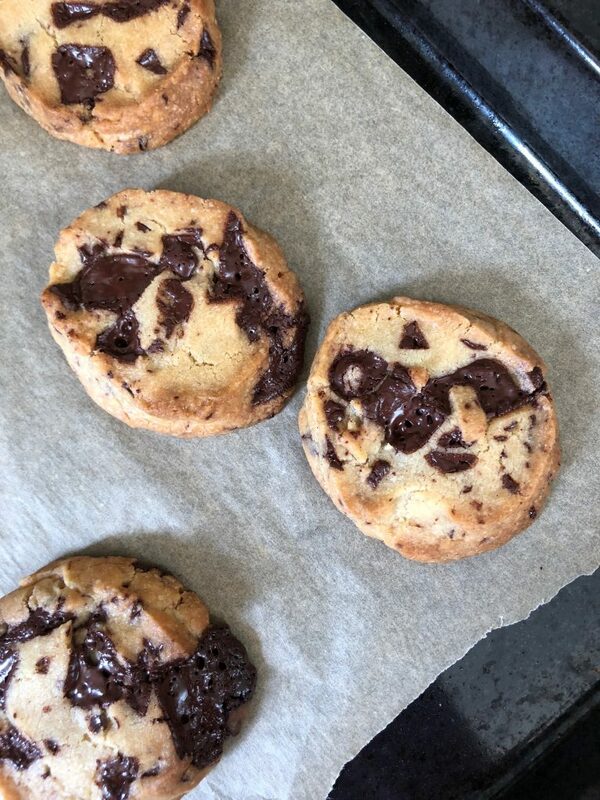 They first appeared in Alison Roman’s cookbook Dining In almost a year ago, and since then influencers around the world have been posting pictures and getting themselves into a frenzy over these alternative chocolate chunk cookies. I resisted making them until a (now beloved) neighbour dropped round a care package after Joy was born containing four perfect specimens. I was sold. Full disclaimer. These cookies probably will not change your life. 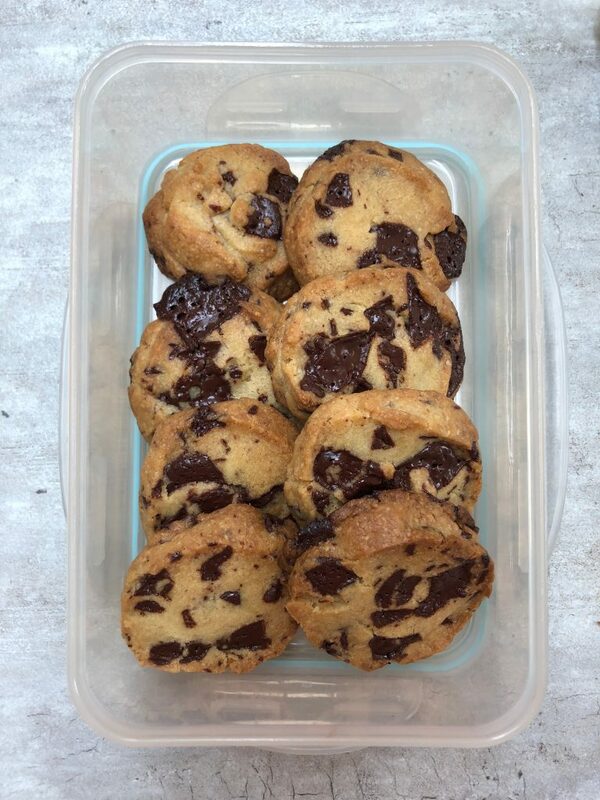 They’re delicious and moreish and everything butter, sugar and chocolate should be, but chocolate chunk cookies as you know them they are not. Utterly revolutionary and mind blowing? Not that either. But good enough to rave about and share with friends and add to your cookie recipe arsenal, they absolutely are. The secret here is salted butter. And a shortbread dough made with brown sugar which delivers butterscotch notes and a beautiful texture. I skipped the demerara dusting because I didn’t have any in the cupboard and they’re plenty sweet enough, but those sugar frilled edges are pretty tasty if you have the time and inclination. I couldn’t have told you that these cookies would go viral, but having never heard of Alison Roman until earlier this year, I’m very glad they did. 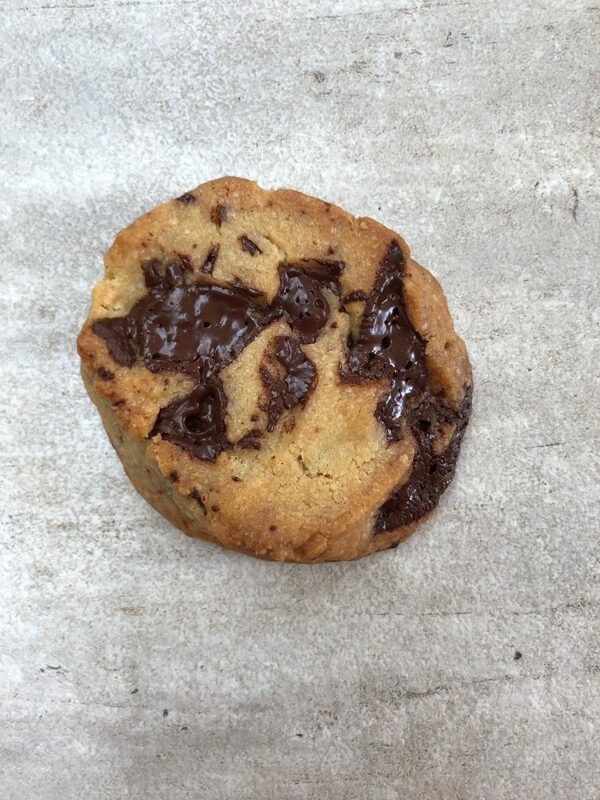 The most famous cookie on the internet, Alison Roman's cookies have been made a million times over. Possibly sacrilege, but I've omitted the crisp sugar edge here for simplicity and personal preference. You can find the details on hundreds of websites and blogs, if you disagree. Place the butter and sugars into the bowl of a stand mixer and beat together for 5 minutes or until light and fluffy. Add the vanilla to the butter mixture and beat for 30 seconds to combine. Add the flour in one go and mix on low speed, just until the dough is combined. Add the roughly chopped chocolate and mix briefly just to evenly distribute throughout the dough. Tip the dough out onto the work surface and use your hands to gently bring together into a ball. Cut the dough into two roughly equal pieces and use your hands to form into rough sausage shapes, about 2 - 2¼ inches in diameter. Wrap the logs in clingfilm and refrigerate for two hours. When ready to bake, preheat the oven to 180C and line a baking sheet with parchment paper. Remove the logs from the fridge and discard the clingfilm.Use a thin sharp knife to cut the logs of dough into cookies about ½ inch thick. Place onto the prepared baking sheets, an inch or so apart. Bake in the preheated oven for about 12-15 minutes until just starting to turn golden around the edges. Let cool slightly before transferring to a wire rack to cool completely. Kept in a sealed container these cookies will keep for up to 5 days. This is the first recipe I have made from your blog and it was sooo good. I usually don’t make recipes because of them going “viral” but this seemed like a nice change-up of the chocolate chip cookie. 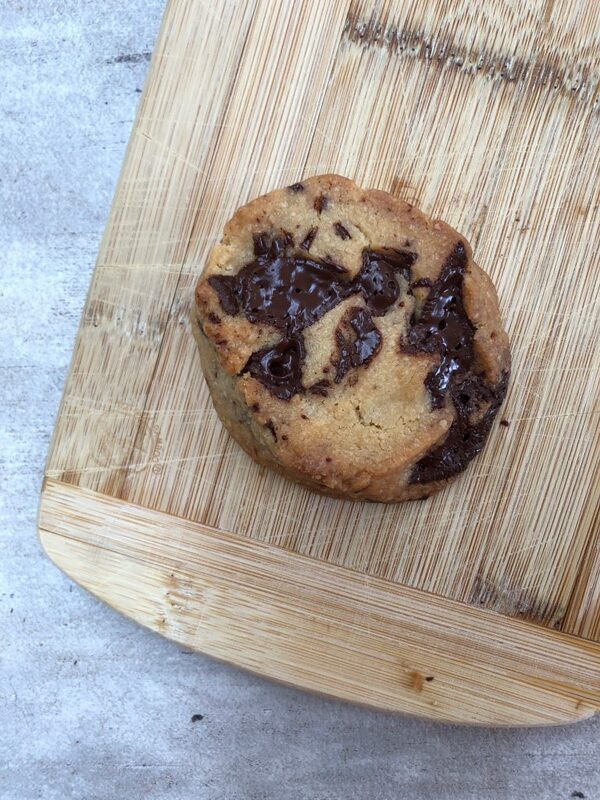 And I doubt that I will ever go back to the mainstream chocolate chip cookie after making this recipe. Thanks so much for posting it. 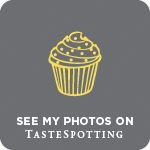 Can you recommend any of your other recipes that are worthy of the same amazingly great status?